Most people train – week in and week out – with the same exercises over and over. Little variation with exercises will eventually stall progress and create boredom. Many small changes to an exercise can help overcome sticking points and strengthen any weak points. Sometimes it’s hard to change things up when you’re training in a commercial gym with no access to small accessories. Instead of complaining about the lack of equipment, take matters into your own hands. With minimal investment, you can rejuvenate your training and hit some new PR’s. Boards for board pressing– You can make these for just a few bucks and make them any height needed. If your carpentry skills are lacking, you can buy them for under $25 – 1 Board, 2 Board, 3 Board and more. 3″ Cable Grenade Balls– Personally, I love these. Use them for cable pushdowns, face pulls, side raises, curls, and rows. My favorite is attaching them to chains for tricep extensions, curls and side raises. Grip training at it’s finest! Even buying just one will allow you to do single arm exercises. Bands– These have been around for years, but I still don’t think that many people take the leap to purchase them. I could do an entire post on the different bands (regular and short and all their uses), but they are great for reverse band bench, deadlifting against, assisted chin-ups and extra workouts at home. Double 3″ Grenade Balls– Might as well get a pair. Easy to toss in your gym bag and take anywhere! Fat Gripz– Many people underestimate what Fat Gripz can do besides the obvious – making the bar thicker. When you add Fat Gripz to the bench press bar, you’re actually making the bar path slightly longer as the bar has to come down a little further to touch the chest. It’s not much, but it can make a difference. It can help relieve some elbow pain as well. Not only does it work well for barbell lifts, but also on dumbbells and cable attachments (for pushdowns, face pull, etc). Bodyweight Training DVD– Training and lifting doesn’t always have to be with weights. Get some new variations with bodyweight exercises. Manta Ray– No, the manta ray is not a “pad” to keep the bar from digging into your neck when you squat. Quite the opposite, actually. Most commercial gyms don’t have a safety squat bar on hand and while the manta ray is not the same, it does offer some of the same principles. The manta ray sits the bar up higher on your shoulders, lengthening the distance between the bar and your center of gravity. This makes the torso work a little harder. The manta ray can also offer some relief in the elbows and shoulders for those with poor shoulder mobility when squatting. My list was going to end there when I realized that there are quite a few really determined and motivated folks out there that might want a little more. Exercise Index Bench Press DVD– This DVD contains max effort movements, accessory movements, supplemental and an in-depth break down of technique. Remember, most people don’t realize how in-depth the bench technique really is. And at only $55, your best might thank you. Shoulder Saver Pad– This portable accessory can change your bench training dramatically. Without the bulk of the boards or gym managers harassing about bringing boards in, this pad might be your answer. The shoulder saver pad works wonders as a 2 board. Now you can do a 2 board without needing a partner to hold the boards! If you turn it flat side down, it’s the width of a 1 board! Sandbag– Load it and do work! Fireman’s carries, squat and press, shoulder carries and zercher lunges are just a few exercises that can be made a little harder by using a sand bag. 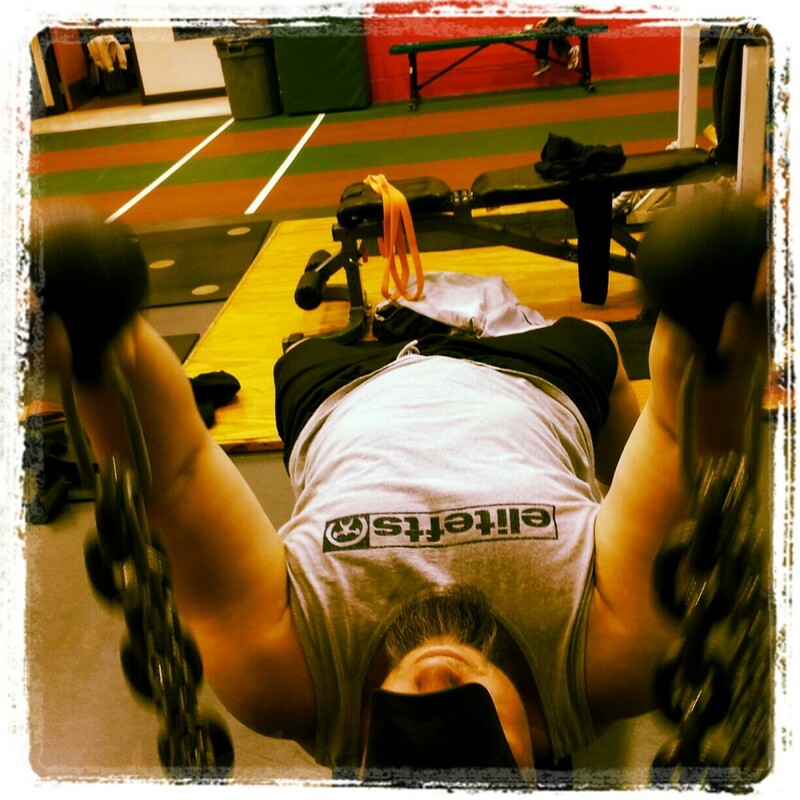 Pair of chains– These chains are 5/8″ can really build your bench, squat and deadlift tremendously. You can use them on dynamic days for speed work, or you can use them on max effort days for additional poundage that gets heavier as you lift the weight: lockout strength at the top of all three lifts! Blast Straps– Easy, portable addition for tons of bodyweight variations like rows, lunges, facepulls, pushups and more. And did you know????? The FREE exercise index at Elitefts has a TON of exercise ideas that you can search for by muscle groups. Grab some of these inexpensive items to help transform your training sessions. If you find something you love, let me know!